On a semi-annual basis, SVAM (Southwest Virginia Alliance for Manufacturing) calls upon member companies to participate in small career forums. One such forum was recently held at the Ampersand Center at Emory and Henry College located in Emory, Virginia. 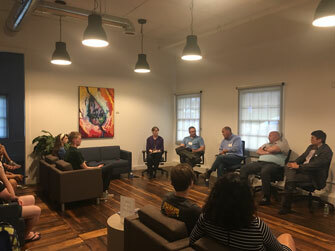 Panelists included: Jim Coe (Engineering Manager-Somic America), Kevin Mumpower (Vice President of Product Engineering-Bristol Compressors), Eric Miller (President and Owner of Wolf Hills Fabricators, LLC) and Tekai Shu (Social Media and Business Development Manager-Strongwell). Throughout the forum, students and panel members discussed the quality of life of employees, benefits, generational differences, demographics, models of advancement, alignment of careers, compensation models, and how manufacturers support communities. Students were particularly interested on tactics and tips for interview questions and how manufacturing knowledge was transferable into other sectors. Many thanks to Mandy Barker (Program Assistant-SVAM) and her team for organizing this event.